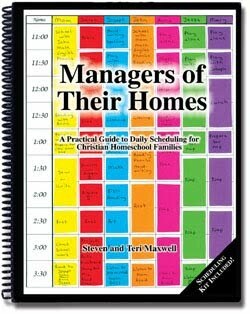 This Beautiful Grace: Mommy Monday: "Managers of Their Homes"
Mommy Monday: "Managers of Their Homes"
I got inspired about the book after my friend Rachel bought it. It comes from the http://www.titus2.com/ website, which has lots of great resources that SAY they're for homeschoolers but are really just great tools for alll parents. The book is all about scheduling your day and working the schedule until it becomes second nature. I have used a checklist-sort-of-schedule for years. This book helped me to do some refining and gave me a kick in the skirtus. It also made me face the reality of how much time things actually take. I am trying to adjust my world accordingly. My schedule is not perfect. I do not keep the schedule perfectly by far.... Even when I do keep it, I still marvel at what doesn't get done. Some days seem to turn upside down with or without the schedule. But it's in the back of my mind, giving me direction for the day. And I am fitting in more things more often. That's enough. This whole idea should not be a guilt issue for those who don't use home scheduling. You shouldn't try it unless there's something in you that wants to. Millions of mothers have survived without a schedule. It's not required for good motherhood or wiferhood or anyhood. It's just something that has really, really helped me with my days. I think my patheticness requires it. It seems that the behinder I get, the behinder I get. Until I can literally find myself wandering around the house in circles, wondering what to do next. Sometimes I'll tell David...Okay. These are the things bugging my brain. Tell me what is most important to do RIGHT NOW. Well..my schedule does that for me. It just gives me the next thing to do to help me keep moving through the day productively. I love to use it as a checklist. I highlight each thing as I get it done and love to watch the page turn pink or yellow or orange. I even add other things I accomplish just so that I can mark them off and see that I actually DID accomplish something today! It also is a sort-of defense for me when I feel the "you don't do enough" hammer getting ready to beat me to a pulp. My schedule proves that life takes time and I'm not a total loser. In my opinion, this book is expensive and can make scheduling seem complicated. But it's worth it if you're seriously looking for some good ideas for getting things done. And I think it is even more awesome for those of you who balance homeschooling and homekeeping. You have my admiration a thousand times over. I first started using a written schedule/checklist as I internalized some of flylady's ideas. I use a simple table in microsoft word and set it up in half-hour increments down the side with days of the week across the top. Whether you buy this book and make a wall chart or use flylady's planner or a spreadsheet like me, I think it's absolutely essential to remember that this is a tool to help you, not a hammer to beat you. The schedule serves you - not you the schedule. It's not only OKAY to change other's ideas to fit you. It is necessary. Here are some basic ideas for getting started, for those of you that are curious. 4. Schedule 15 minutes of decluttering or deep cleaning in your Flylady zone. (www.flylady.net). Over the years, I have adapted mine from flylady's suggestions to fit our home better. Practice with all the kids, read-aloud time with kids, walk & pray, kid bath time, cleaning car, meal prep & cleanup, family devotions....if you're lucky - time to brush your teeth and wash your hair. But if you put in the first 4 things above, you will create a framework for the week. I am trying to do my schedule a little more "scheduled" now. But that in itself can create some frustration when the day turns on its head. I have also been amazed that that even on days when I follow the schedule almost perfectly, I can get to the end of the day and look around and wonder why things don't look better. So these ideas are not perfect or magical, by any means. But they have sure helped. And goodness knows this mamma needs all the help she can get. Totally had to laugh out loud when I read this statement, "I even add other things I accomplish just so that I can mark them off and see that I actually DID accomplish something today!" I have had to do that since Megyn has been born. I feel like most of the time I am just making it from day to day and in fact, had a serious melt down just last week about all the stuff I'm NOT getting done. But I have been reassured that my "job" right now is to take care of Megyn first and foremost. This season too shall pass.